A gyroscope is a spinning wheel or disc in which the axis of rotation is free to assume any orientation by itself. When rotating, the orientation of this axis is unaffected by tilting or rotation of the mounting, according to the conservation of angular momentum. Because of this, gyroscopes are useful for measuring or maintaining orientation. 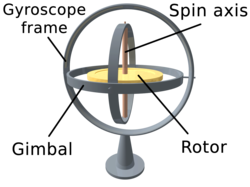 Applications of gyroscopes include inertial navigation systems where magnetic compasses would not work, as in the Hubble telescope, or inside the steel hull of a submerged submarine, or would not be precise enough. Due to their precision, gyroscopes are also used in gyrotheodolites to maintain direction in tunnel mining. Gyroscopes can be used to construct gyrocompasses, which complement or replace magnetic compasses (in ships, aircraft and spacecraft, vehicles in general), to assist in stability (Hubble Space Telescope, bicycles, motorcycles, and ships) or be used as part of an inertial guidance system. However, it should be mentioned that Dr. Robert E. Klein of the Mechanical Engineering Dept., University of Illinois at Urbana-Champaign, showed conclusively, by a sequence of experiments, that gyroscopic action is not needed for the stability of a bicycle.